Time and Date Calculator 3.2 - Download Win Apps. 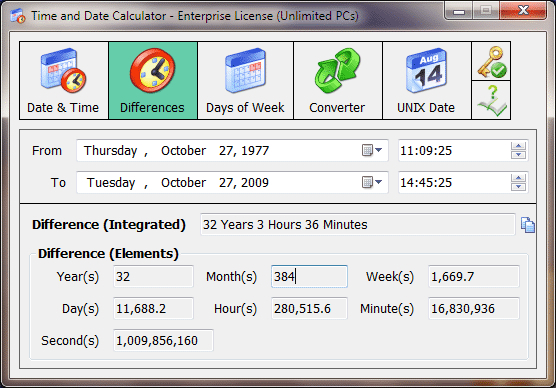 A powerful and easy to use date time related calculator, counter and converter..
TADC is a powerful and easy to use date / time related calculator, counter and converter. It has 5 main purposes: Calculate target date & time by adding/subtracting some time elements (months, days, hours...) based on a specified time. Calculate time differences between two times. Count days of week/weekdays/weekends between two dates. Convert between each time element. Calculate/convert between UNIX Time and Calendar.